Photography is tremendously popular among the young in Asia. With this ease of use of digital cameras, especially modern compacts and SLRs that are widely used, SEAMO SPAFA believes that the fine art form of photography will undergo important developments, behind which Southeast Asia can be a significant driving force. 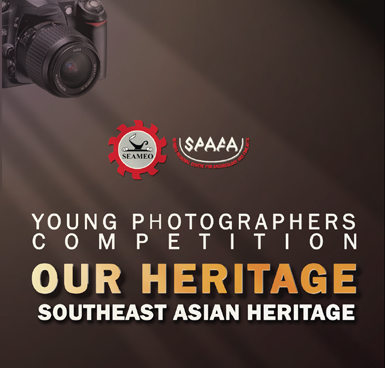 SEAMO SPAFA is organising a photo competition, under the theme “Our Heritage”, with the aim of exploring photography as a means of creative expression for Southeast Asian youths to make personal photographic statements on their cultural identity and heritage. Thephoto contest is designed to attract and inspire youths to become involved in the conservation of Southeast Asia heritage, and raise awareness of the cultural heritage and diversity in the region. We invite you to participate in the Young Photographers Competition by submitting images that capture a message or your perspective relating to cultural, natural or built heritage in Southeast Asia. We’re seeking engaging images of our diverse and rich heritage. Share what you see through your lens. Participants must be between the ages of 18 and 25 at the time of submitting entries. 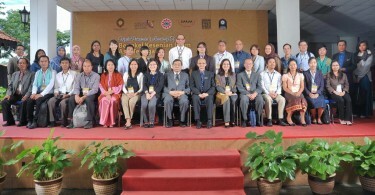 Participants must be citizens holding passport from any of the 11 SEAMO member countries (Brunei, Cambodia, Indonesia, Laos, Malaysia, Myanmar, Philippines, Singapore, Thailand, Vietnam and Timor-Leste). Images in colour or black and white film, or digital images. Images must be taken with a film camera or a digital camera. Entries must be creative images relating to Southeast Asian Heritage. Participants should be innovative and experiment with techniques. All images should be saved on a CD as JPEG files for submission. Each image should also be printed on 13 inch x 15 inch photo paper (we will use this as the colour guide for making exhibition prints if your entry were selected as winning piece). Winners will be announced on Friday 25th of February 2012 on the SPAFA website – www.seamo-spafa.org, and notifications will be sent out by email. The Overall Winner will receive a cash prize of US$ 1000. All winners will be entitled to participate in a master-class photography workshop and photo fied trip in Thailand (expenses including airfare and accomodation will be borne by the organizers), and their work will be exhibited and published in a photograhy publication. Each of the winners will receive a Certificate of Creative Excellence. Monday 20th February 2012, Conference Room, Ground Floor, SPAFA Centre. The judges’ decissions will be final in all respects. Additional judges may be appointed.